This work of mine is a close-up illustration of a young woman. I used the app Procreate. I enjoy the intricate designs within her eyes. I feel like she has a secret, but she won't tell anyone. The smooth structure of her face adds a certain level of calmness. It is absolutely stunning! Great work! The world gives you so much pain, and here you are making gold out of it. This is incredibly dynamic!!! I can feel the fluidity and vibrancy of her face as she gazes into the camera, prepared to post this flawless photo on instagram or see it in a "Seventeen" magazine page. 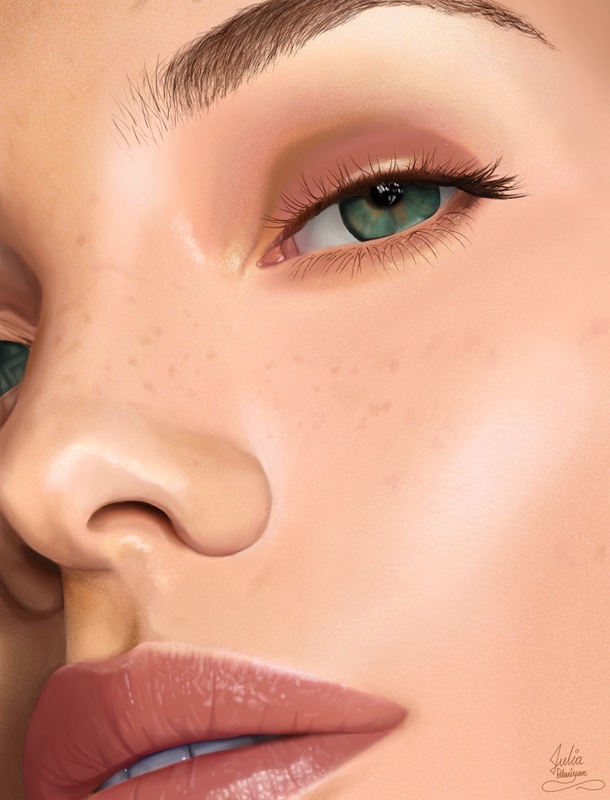 Love the details like the freckles and iris! Great work, I really enjoyed seeing and enjoying this illustration!!!! hArRy PotWaH dId yoU puT yOuR nAmE iN thE GoBleT oF FIWAHHhH?!? @littlesun Haha thank you so much! @bobs_sphere I loved exploring the noise brush with this artwork, thanks!